We have curated some ideas which you can try to achieve a truly beautiful galley kitchen which optimizes space and is high in functionality. If you want to take advantage of your existing ceiling height and the available light, a U-turn kitchen is the best option. 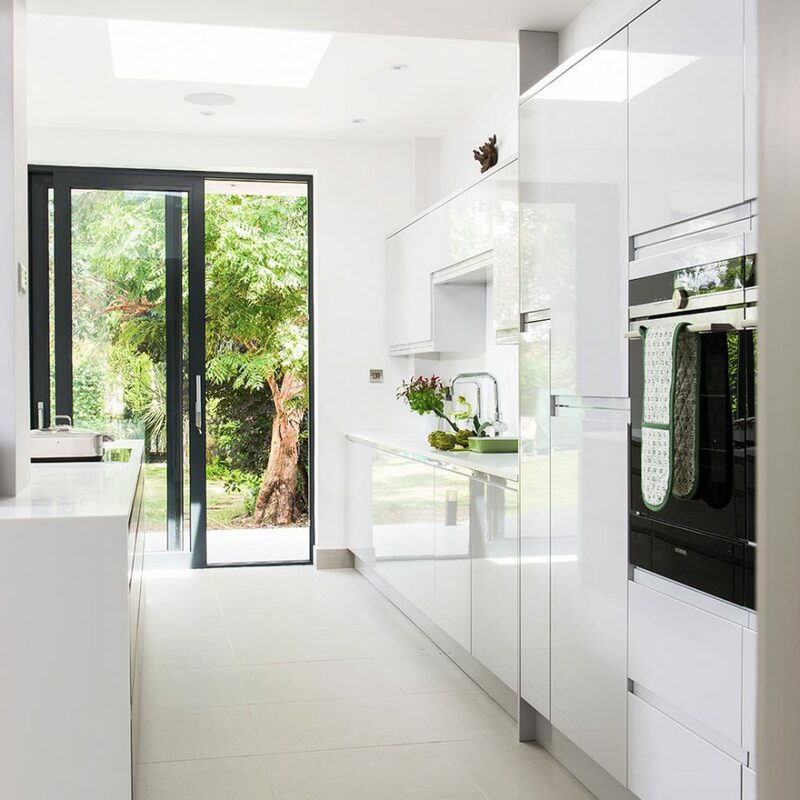 A glass front door and white painted cabinet will help to make the space feel more open and generous on the other hand the location of the sink will provide a breathtaking view of the outdoors. 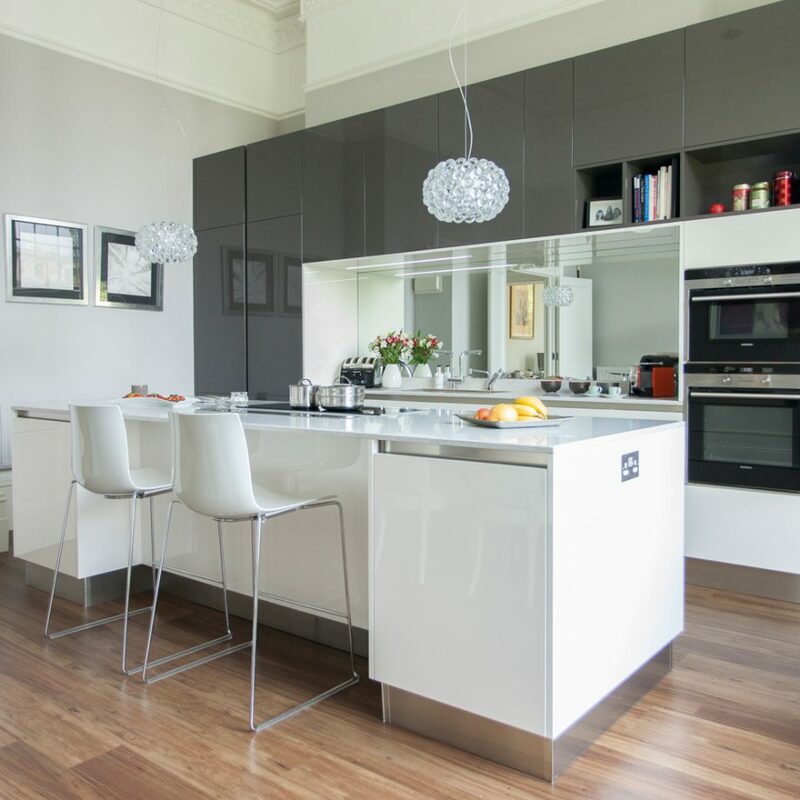 Adding some sleek and modern units in the galley kitchen works very well and the glossy cabinets create an optical illusion of more space in a small galley kitchen. The neat handless cupboards help to keep the place minimal and smart - with no knobs or bars to catch on when you’re working. Keeps this minimalistic style going by keeping the worktops as free of clutter as possible and integrating the appliances carefully behind the closed doors. 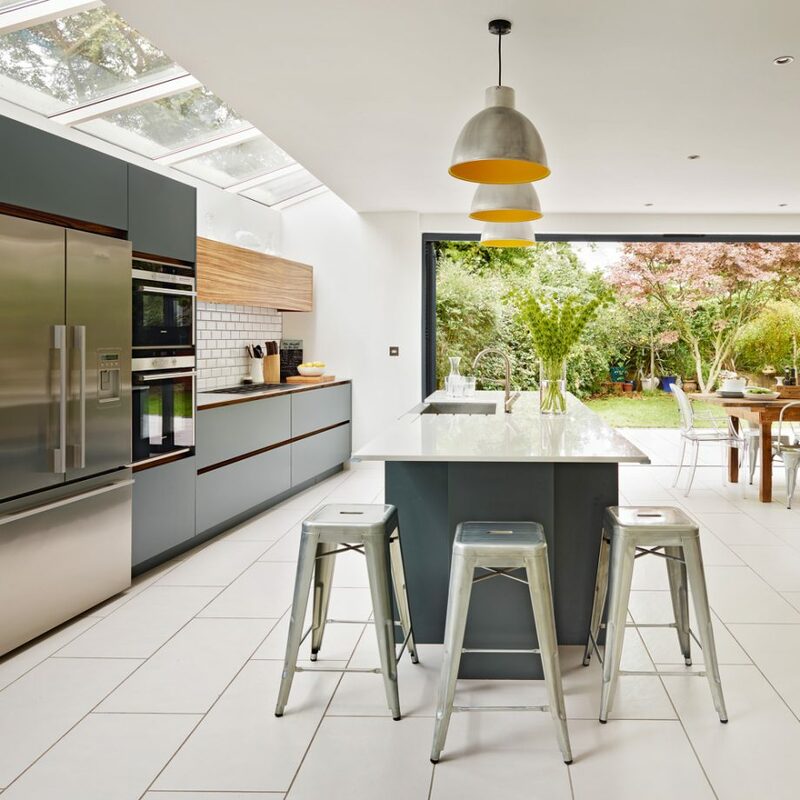 This linear layout fits perfectly in today's trend of large and open plan scheme. However one of the most practical and popular options is the basic design principle of two parallel runs of units. This stylish galley kitchen incorporates everything from- streamlined surfaces for food prep, integrated appliances at practical levels, and a breakfast bar for a quick-and-easy meal. What’s more? 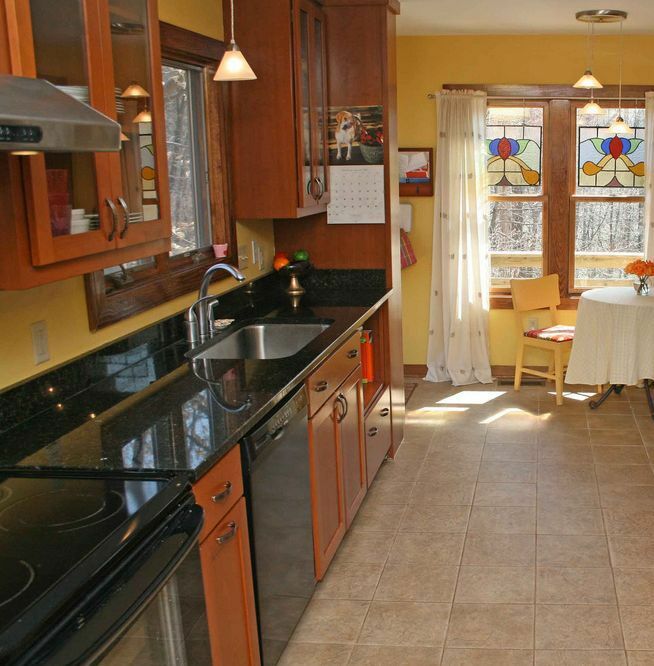 It also provides plenty of space for formal dining. You can create a beautiful unison of handless units and wooden flooring which leads your eye down towards the glass door which leads to a beautiful garden path. This look strengthens the link between the indoors and the outdoors and makes the space feel relatively less restricted and less compact. Put some thought into the door and go for one which is a sliding door so that nothing interferes with the flow of the room. 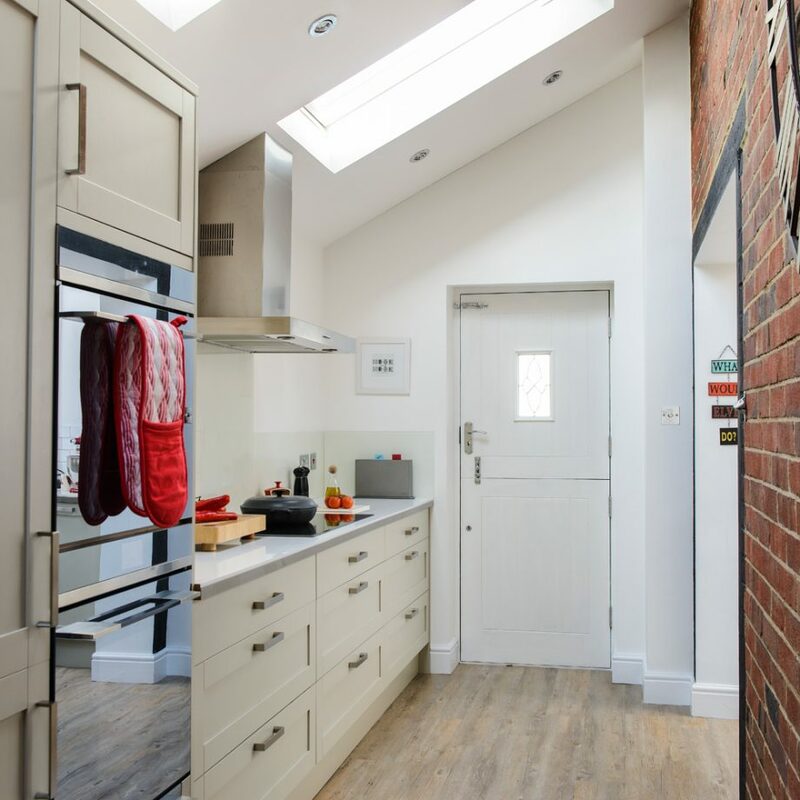 A modern scheme or a country scheme both go extremely well in a galley kitchen style. You can make your kitchen space feel bright, airy and fresh with this neutral walls and cabinetry. However, if you want to add that rustic charm go for a butler sink and open dresser style giving the space a typical farmhouse charm. 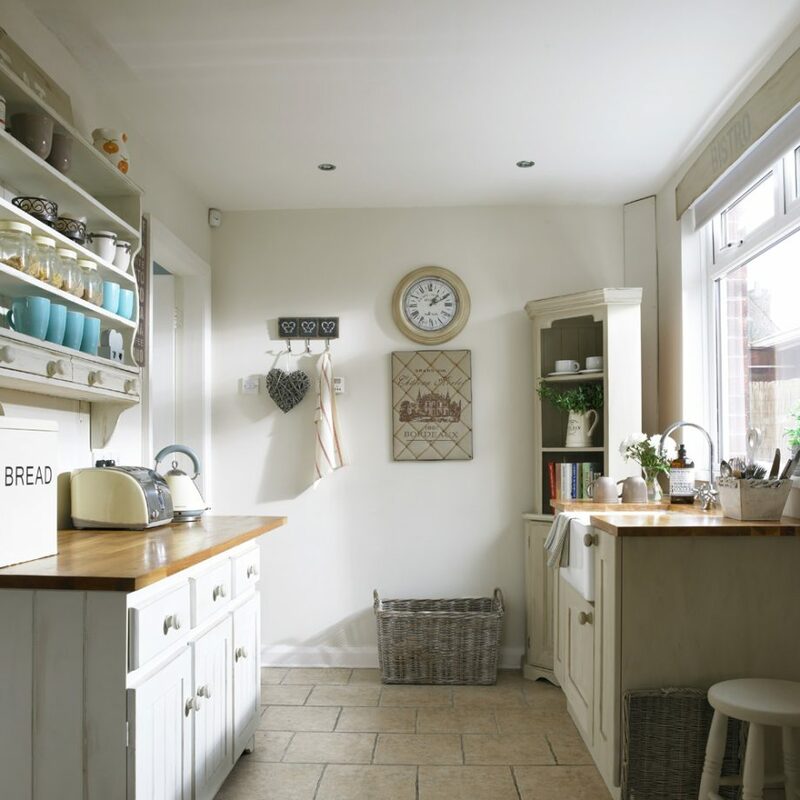 You can also accessorize with some vintage accessories like wooden hooks and pretty storage which is a practical solution to keep the clutter down and make it easier to cook. 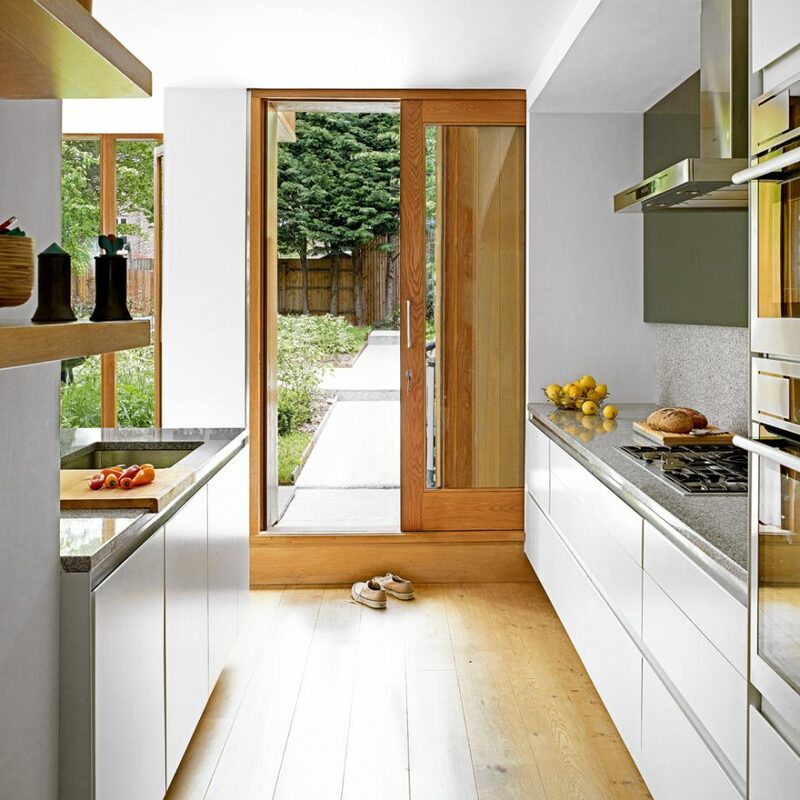 The perfect way to optimize a small space is to have a single galley design with side kitchen extensions. You can easily combine a pale color palette which acts as a reflective surface to optimize the skylight to the maximum, whereas the urban exposed brick walls add a rich urban look to the space. Galley kitchens are long gone from boats and today they occupy a huge space in the homes. Today many people are going for smaller homes due to space constraints as well as the hassle of maintaining a large home. This means a lesser need for a massive kitchen. Here a galley kitchen is a perfect option as it provides the basics that you need in the kitchen- counters, storage, range oven, and sink and sometimes even much more. Add white to your existing galley kitchen will definitely give it a sharp modern look along with making the space look big and clean. Another important thing to keep in mind would be to add generously sized tile as compared to small mosaic tile to make the place look bigger. An all-white scheme also disguises the basic units and creates a bright and polished finish. With some long, unbroken runs of cabinetry on each side, even a small galley kitchen can look and feel monotonous and boring. Introduce a splash of color to change the entire dynamics of the kitchen. 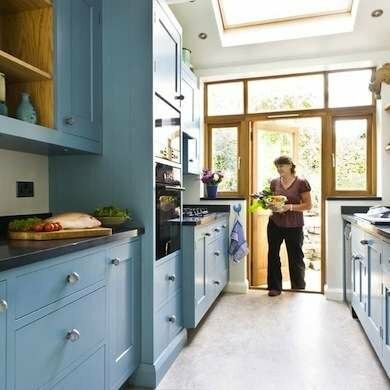 You can use many different colors; however, using a blue tone will help the cabinets to pop off the white flooring and walls changing the look and feel of the place. 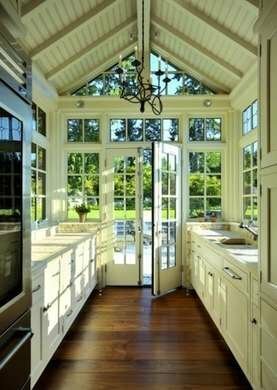 You can also try an incredible greenhouse inspired galley kitchen them to add some height and extra light to the space. Take full advantage of the abundant glazing to achieve a truly unwashed space making it look bigger than it actually is. Further, the airy space makes the rich plank wood flooring look as if it would float away. If you like to chat and cook at the same time add an island galley with a breakfast bar to the kitchen. This will allow you to cook and entertain at the same time. Further, it will also naturally gravitate people towards the space if you decide to illuminate it with some statement lighting. This light will act as a central feature to the kitchen and allow even the chef to remain a part of the conversation even when their backs are turned around to the guests. This kind of a galley kitchen is more down to earth as compared to the luxurious all-white kitchen. This kitchen means business and is a total working kitchen. 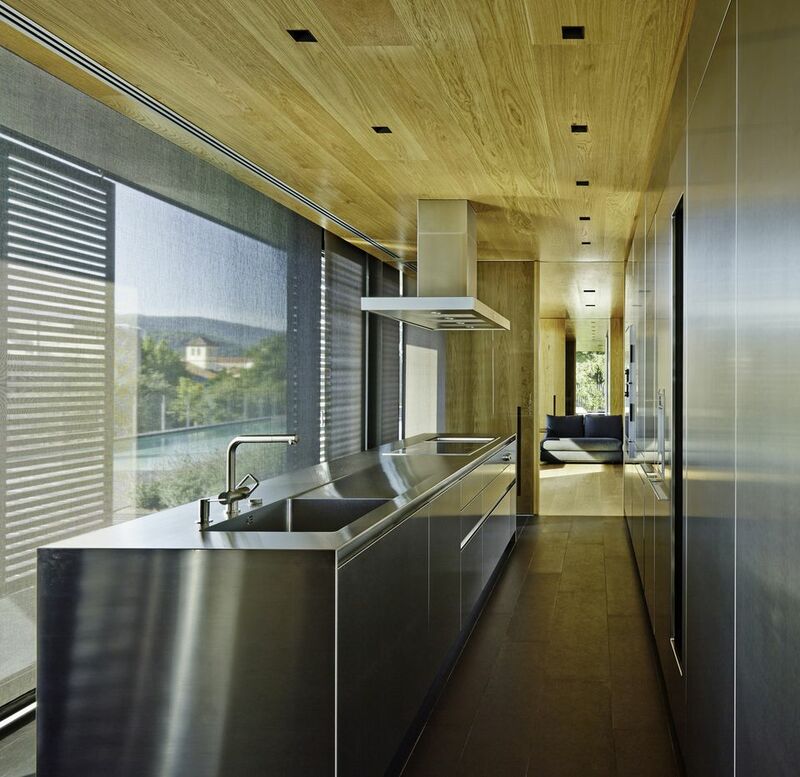 This kind of a galley kitchen runs on a long wall whose length transfers to a long black engineered store countertop. 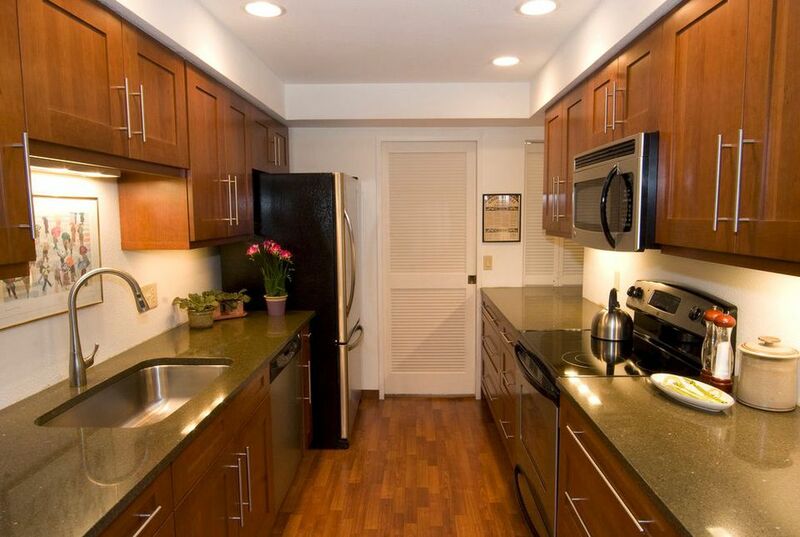 If you think that you will be short on storage with a galley kitchen, think again! 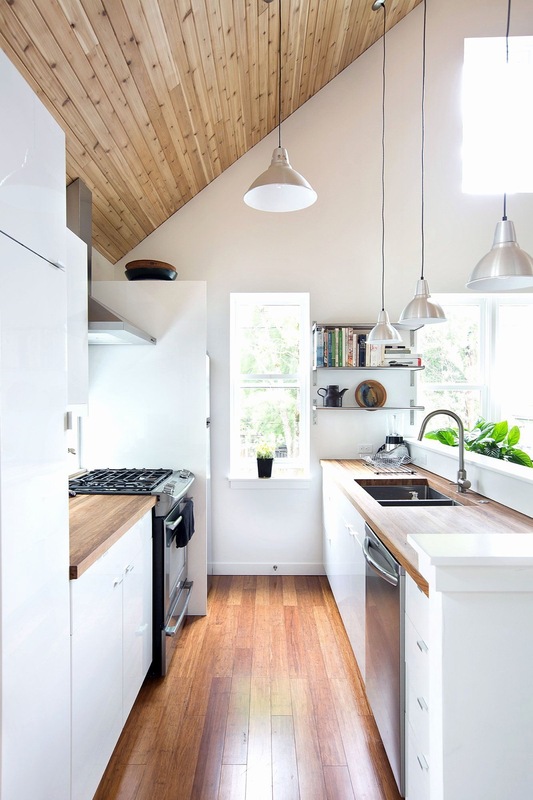 This galley kitchen design totally subverts the whole galley kitchen notion. Here the refrigerator is placed against the long outer wall which allows you to gain a ton of storage space, with the only drawback of having your refrigerator sticking out beyond the counters. However, you can also find a simple solution to this problem by replacing your regular refrigerator with a counter depth refrigerator. 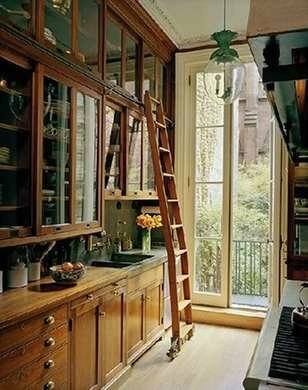 Tall cabinets in the kitchen may be very difficult to reach; this is where the library ladder comes in use, also being one of the best galley kitchen ideas. The ladder plays the dual role of providing a practical value, further, if you have a vintage ladder it will also provide a great look to the place. 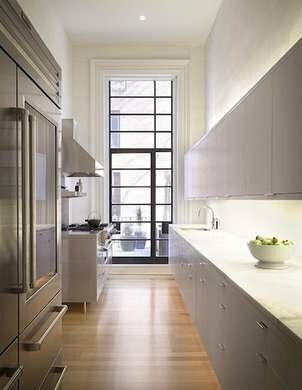 In this traditional galley kitchen, glass fronts help provide easy sight lines to the items inside the gorgeous cabinets. Adding some pendant lights to the kitchen add a whole new industrial charm to the whole place. On the other hand, the stainless steel appliances extend the theme and provide some sheen which is perfect for a small space. To maximize space efficiency add some open shelves and a built-in bar to achieve the best effect. You can make a beautiful and elegant mix of materials by mixing wooden floors with soft solid surface cabinets, marble tiles, and countertops to add some interest to a long space. Sometimes galley kitchens may suffer from having narrow aisles, but having some space between the counters can easily make multiple cooks work together at the same time. You can also add a commercial style faucet to increase utility and add to the unique design of the space. Galleys are a good budget choice, as by using clean lines and crisp design, you don’t need to spend a fortune to create a functional and stylish kitchen. The completed look will give you a simple and clean feel. 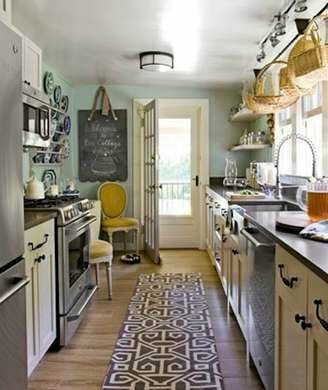 So, go ahead choose from these beautiful ideas and transform your galley kitchen into a truly beautiful space.